French bulldogs, or “Frenchies,” as they’re lovingly referred to as, are one of the most sought after dog breeds in the world. A cross between English bulldogs and Paris ratters, French bulldogs are known for their small stature, muscular build and smushy face. They are extremely playful and loyal animals, making them the perfect companion for single individuals and families with small children alike. With a bit of a stubborn streak as well, these dogs are known for their human-like personality and require a bit of patience to train. However, once trained, the Frenchie demonstrates remarkable intelligence and an eagerness to please beyond that of any other dog breed. Because of this mix of great traits, French bulldog puppies of all sizes—teacup, miniature and toy included—are a much sought after breed, and therefore, quite pricey, averaging anywhere between $2,500 and $5,000. Why Are French Bulldog Puppies So Expensive? Simply put, well bred Frenchies are rare. Unfortunately, there are not that many high quality dogs of this breed, but that doesn’t mean that demand for them has lessened any. This is especially true of the more popular mixes of the breed, such as rare blues and chocolates, and the even rarer pure blues, pure blacks, black and tans and blue and tans. More common brindles, sables and fawns that are well bred are still expensive, but because they are not as sought after as the others, they are slightly more affordable. With that said, what’s the reason for the high cost? French bulldogs are not easy to breed. For starters, due to their narrow hips, French bulldogs are incapable of breeding naturally and so females must be artificially inseminated. This is a fairly expensive process that takes a significant amount of time. Secondly, Frenchies tend to have small litters, with an average number of live births topping off at four, but going as low as just one to two puppies. This makes it difficult for breeders to break even after vet costs and artificial insemination expenses. Third, because of their large heads and stocky shoulders, Frenchie puppies cannot be delivered naturally, as that would cause considerable damage, if not death, to the mother. Instead, they must be delivered via C-section, another expensive procedure. Lastly, puppies of this breed require a great deal of care and attention in their first months of life. From needing to eat every three hours to ensuring that the mother never rolls over a member of her new litter (it happens accidentally, but frequently), a rare French bulldog puppy requires round the clock attention that most breeders just do not have the time for. On top of all that, the normal vet bills, cost of medications, toys, food, shelter and play area make breeding French bulldogs a difficult and expensive endeavor. 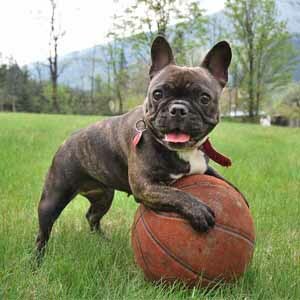 However, despite their high price tag, bulldogs of all kinds—miniature, teacup toy and French English bulldog mix, French bulldog Boston terrier mix and French bulldog Shih Tzu mix—are wonderful dogs that love their owners. They are relatively low maintenance, enjoy lying around the house all day and will be there to cuddle with you any time of day or night. Owners of French bulldog puppies treat their pets like their human, and for good reason: this breed has one of the most human-like personalities of any other dog breed out their, and, more specifically, one of the most hilarious personalities of any breed. With a personality that ranges from rambunctious and playful to calm and loving to times of complete stoicism, Frenchies have an extremely expressive personality, making them the perfect companion for dog lovers. Bulldogs aren’t known for their high energy levels and are mostly famous for their ability to lounge and sleep the day away. For this reason, people who live in small spaces or an apartment complex often choose this breed as their breed of choice. If you work long hours, you’ll never have to worry about your pet getting a lack of exercise, as they’re perfectly content and even winded after running around the house for a few hours each day. Frenchies are great with kids and elderly people alike, as they’re playful but smart enough not to hurt a child. Additionally, they’re very territorial and will protect your little ones from anything unfamiliar. Moreover, bulldogs—especially the miniature bulldogs or teacup French bulldog Boston terrier mix puppies—are small enough to be held without issue. They can jump themselves up onto just about any piece of furniture and are just happy to lay on your lap all day. However, as with all creatures, there will be instances where your bulldog will display aggression or anger. It is up to you, as their owner, to determine what made them feel angry in the first place and to correct the cause. As previously stated, Frenchies do not need a lot of exercise and in general, have fairly low energy levels. However, with that in mind, they do still need exercise to maintain a healthy weight. Short walks or playtime in a small yard is just the right amount of exercise that every bulldog needs. They are not so high energy that they need a large play space to roam around in. An important thing to keep in mind is that bulldogs are prone to heat exhaustion and should not be taken out for exercise in high temperatures. Limit exercise and play time to cool mornings and evenings. When training your Frenchie puppy, keep in mind that bulldogs are stubborn and may not respond to typical training techniques. It is up to you to get to know your puppy’s personality and alter your training techniques to be in line with their learning behaviors. Additionally, French bulldog puppies are not above chewing on your stuff or going to the bathroom in the house. You will still need to train your puppy to not chew on things that could harm them or that you do not want destroyed, as well as crate train them until they are fully housetrained. Most bulldogs eat 1 to 1.5 cups of top-quality dry food a day, divided into two meals. However, each dog is different, and how much you feed your adult bulldog will depend on his size, age, build, metabolism and activity level. Like people, dogs are individuals with their own individual needs. Because of their short hair, French bulldogs are low maintenance and fairly easy to groom. They simply need an occasional brushing to keep their coat luxurious and healthy. When grooming your pup, check his skin for any bare spots, scabs, lesions, signs of infection or rough and flaky skin. Additionally, check his eyes, ears and teeth for any discharge or bad smells. If you notice anything unusual, take your dog into the veterinarian right away, as bulldogs are known for having health issues. It is important that you clean your puppy’s ears regularly with a damp, warm washcloth and to run a swap around the edge of the canal to remove any wax buildup. Never stick the cotton swab inside of the canal entirely. Pay attention to your dog’s nails, as bulldogs’ nails do not naturally wear down and will need to be trimmed regularly. Finally, keep your pup’s facial wrinkles clean and dry to prevent any infections, and clean between his folds during each bath, which should be done monthly or as needed. Brachycephalic Syndrome: Found in dogs with short heads, elongated or soft pallets and narrowed nostrils, this condition results in obstructed airways that can cause labored and/or noisy breathing. Hip Dysplasia: Hip Dysplasia refers to a femur that doesn’t fit nicely in the pelvic socket in the hip joint and is a hereditary condition. Dogs with this condition will exhibit pain and lameness in one or both rear legs, and can even develop arthritis over time. Hemivertebrae: Hemivertebrae is a condition that is characterized by a malformation of one or more vertebrae. Though it can cause no pain to a dog, it can do the exact opposite for others and result in pain, weakness or even paralysis. Allergies: Bulldogs are susceptible to food-based allergies, contact allergies and inhalant allergies a like, so keep an eye out for any reaction to anything new your pup has been introduced to. Patellar Luxation: Common in small dogs, petallar luxation—also known as “slipped stifles,” is caused when the femur, patella and tibia do not properly align. This can cause lameness or an abnormal limp. However, it is present at birth, which is something that any reputable breeder should inform you about. Cleft Palate: A cleft palate is characterized by a slit that runs bilaterally or unilaterally from the roof of the mouth to the nasal and oral cavities. It can be small in size to very large; the size of the cleft may mean a difference between a dog that survives to one that does not. Intervertebral Disc Disease (IVDD): IVDD occurs when a spinal disc ruptures or herniates and pushes onto the spinal cord. When this happen, nerve transmissions become inhibited, causing chronic pain and discomfort. It may even result in temporary paralysis. Elongated Soft Palate: The soft palate is an extension of the roof of the mouth, and when it becomes elongated, it can obstruct a dog’s airways and cause difficulty breathing. Purchasing your puppy from a good breeder can significantly reduce your risk of buying a French bulldog with little health problems. Ask your breeder about the health of the parent dogs, as well as for complete medial records. Because French bulldog puppies are so expensive, many people try to adopt through shelters and other adoption agencies. While this is a very altruistic thing to do, it is not very wise. Unfortunately, most Frenchies that have been put up for adoption have extensive medical issues that are unlikely to be resolved even after extensive and costly medical treatment. After running through their bankroll, many owners find that they simply do not have the funds to care for their pup anymore, and so drop them at a shelter in hopes that someone else can foot the rest of the dog’s medical bills. In the end, an adopted bulldog ends up costing the adoptive parent three times more than one purchased from a reputable breeder. At CT Breeder, we are by no means against adopting a dog and saving a life, but Frenchies found at shelters are almost always un-savable, and it would not do you or them any good to take them home only to discover that you do not have the means to keep up with their sky high medical bills. Breeding French bulldogs is a difficult and expensive process and is certainly not for everyone. However, many people try to breed bulldogs, only to discover after they’ve delivered a litter in which the pups have extensive health issues. However, they will try to sell them anyway, just to get their money back. For this reason, you want to be extremely wary when shopping for a breeder. Contact Breeders: When contacting breeders, ask to see credentials and for pictures of past litters. Ask about their breeding and post-birth process to determine whether or not they are actually worth meeting with. Visit the Breeders: Once you have spoken with them over the phone, narrow down your list of possible candidates, then schedule an in-home visit. Make note of every detail of the place, and look out for cleanliness, adequate food and water and proper toys. If you notice more than one dog breeding at a time, you may be at a puppy mill. Look Out for Puppy Mills: Puppy mills are breeders that breed several dogs at a time just so they can make a quick buck. They do not care about their dogs’ health and are likely to sell you a bulldog with just as many health complications as any bulldog you adopt from the shelter. Request Documentation: Responsible breeders will be able to provide adequate medical records for the pup from a veterinarian. They should offer this information up front, but if they don’t, simply ask for it. If they refuse, stay away. Finally, always thoroughly investigate the breeder about any potential health problems, family history and any other questions or concerns about your future puppy. The best breeders will be willing to address any and all concerns, while puppy mills will shy away from even your most basic questions. French bulldogs are not outdoor dogs, as the heat causes stress and overheating. Never leave your Frenchie alone in the car. Bulldogs are social, so bring them to the dog park and let them socialize with your friends! If you own a pool, reconsider buying a French bulldog puppy, as they WILL sink! Bulldogs are loveable and playful, but they are also hardheaded, so if you do not have the time or patience to train your dog in a way that they’ll understand, they may not be the breed for you. If you’re interested in purchasing a French bulldog puppy, turn to CT Breeder and ask about their French bulldog puppies for sale – (203) 920-4950.